In between 10 km are 15 woldclass Surfspots for every skill level. The waves are very good all year round and the water temperature is always 28°C. Bali is a paradise for surfers and its not easy to find another place in the world, where you can learn surfing that easy. Mostly we go surfing with the surf school at Padang Padang Beach. 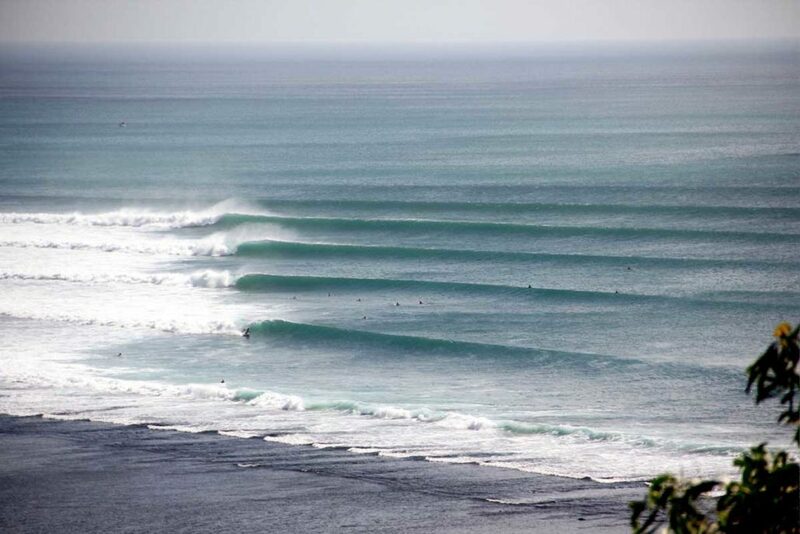 Of course we only surf at Baby Padang, which is a small and very easy right breaking wave. Padang Padang offers 90% of the year very good surfing conditions for beginners. You can sit and wait in the channel for instructions, or just relax and watch the others. At Padang Padang Beach, everyone can surf a wave on the first day and your skills can be improved very fast. If the waves are too big, we will dive to another surfspot near by. Its very interesting to watch the professionals surfing on a big day Padang Padang Left. Unfortunately its only a few days a year. The Beach is also good to relax and swim a little bit. Its a small bay with a 50m Beach and lifeguards for safety. Food and drinks are supplied by the locals at the beach. Advice: Please always remember to not leave any expensive belongings at the beach. The most safe place on Bali is a local people who is selling food or drinks at his Warung (small Shop). Its like take and give. He will take care of your belongings and you can buy a drink or something to eat to support the locals. Please never leave your stuff inside the motorbike or unwatched at the beach. Balangan is one of the most beautiful beaches around. White sandy with palm trees. It offers a left breaking wave and is good for every surf level. If Padang Padang is too small, we will go surfing with the surf lessons here. As the surfspot is more than 200m wide, we have lots of space to practice and catch some nice waves. There is no Channel at Balangan, so its a bit more exhausting and more difficult to paddle out. Bolognan is same as Padang Padang very good for surfing beginners and fast progress can be made. If the waves are bigger than 1,5m, Balangan is only good for intermediate and experts. It is also a good spot for intermediates to try some bigger waves. 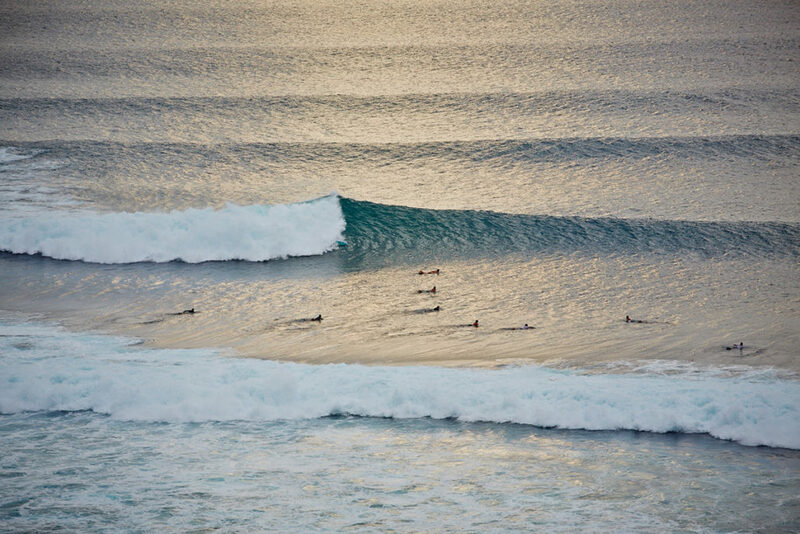 Balangan offer the best waves for experts from 2,5m faces on low to mid tide. Uluwatu is a dream for every expert surfer. All year round very good consistent waves with many different peaks and long powerful rides. If the waves are flat or very small everywhere else, slightly intermediate can also try to catch a wave at Uluwatu. If the waves are big, its a show to watch all professionals surfing at Ulus. Grab a beer at one of the nice Warungs and enjoy the special atmosphere. The beach at Uluwatu is very small and not very comfortable to relax. But if you go on mid to low tide down to the beach, you will find a small cave on the left side. Go trough that cave and you will find a 100m long white sandy beach to relax and swim. Be careful with the time to go back, as the water gets to high the cave is not walkable anymore. But most of the guests are sitting in one of the many Warungs at the cliff. From there you have a beautiful view to the surfers and amazing sunsets. Same as the name its unfortunately often impossible to surf a long ride at Impossible. Only on big days and very good days you can get on low to midtide 300m rides. If the waves are small, beginner and slightly advanced surfers can also surf here on hightide. Be careful to get out of the water on hightide. The waves breaking just in front of the rocks and there is no more beach. The beach is also very nice to relax and swim. Like already said, there is no beach on hightide. So the best time to go to the beach is on low and mid tide. The beach is 200m long and separated of rocks which spend comfortable shadow. There are no Warungs at the beach. So don’t bring expensive belongings down to the beach. Bingin is a very nice small beach with lots of Warungs. At sunset time, you can get fresh fish to eat directly at the beach. The parking area is a bit inside and you have to walk to the beach around 300m. The surfspot is only for advanced and experts. The fast and powerful left is breaking on a shallow reef. If you are safe on take off and don’t mind to hustle a bit with many other good surfer you can get very good rides and easy barrels at Bingin. There is also a small right-hander breaking when its small. The local surf schools surf there with their students on hightide. Its for sure worth it to check out Bingin for a day trip, its one of the most beautiful beaches with special flair. Dreamland Beach was a dream before they been building an big hotel 2005 and disturbed local style Warungs. But it is still a nice beach and on the right side very quite. The left side and front area is full of chinese which want to try bodyboarding and sunbrellas. The sunsets at Dreamland are still awesome and highly recommended. For intermediate surfer it is still a good surfspot with 3 different waves. On the left side is breaking a long left with not much power and in front a shore break where many locals and kids are surfing. On the right side is breaking an a frame peak on low tide with a short and powerful right and a longer left which breaks often closeout. For surf lessons we also go surfing sometimes at Dreamland beach. If the waves are small and the tides are good the waves are beginner friendly. If you want to swim at Dreamland you should be careful with strong currents which pull you out and a strong shore break. Lifeguards are a the beach from morning until its is dark. Nusa Dua is looking like a big Hotel area. It looks really nice and very clean with lots of green areas. The 2 beaches at Mushroom rock and Black stone are long, white sandy and beautiful to swim and relax. As many big and good hotels are in the area, the prices are quite expensive. Nusa Dua is the place where all standard tourist making holidays. 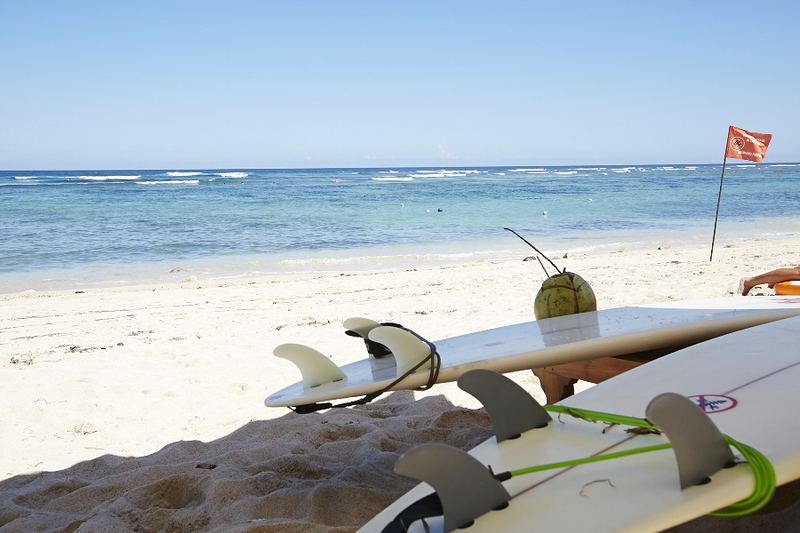 We go surfing at Nusa Dua mainly in low season as the wind turns onshore on our coastline. The waves are only beginner friendly when its small and on hightide. If the waves are too big, we can only surf inside. Intermediate and experts can get really nice waves in a beautiful surrounding as well. Jimbaran is one of the longest beaches on Bali island. Its a long bay, just beside the airport of Denpasar. Jimbaran Beach is mostly famous for its fish restaurants. You can choice and eat fresh fish directly at the beach. Jimbaran is not really worth it to see. There are many big hotels at the beach, but compared to Nusa Dua not that nice. If you want to swim a bit and walk down the beach you are still good with Jimbaran. We only go surfing at Jimbaran if the waves are everywhere too big for us. The spot offers very nice small waves and good beginner conditions. But the waves are too big for other spots only 5 – days a year. So we are not surfing very often at Jimbaran. The Balicliff on the south side of the island offers the most beautiful beaches. Most of the beaches are not yet discovered and very quiet. Most of the beaches are very far down the cliff and you have to walk down many steps for access. So there are no Warungs for drinks and food at the beach directly. 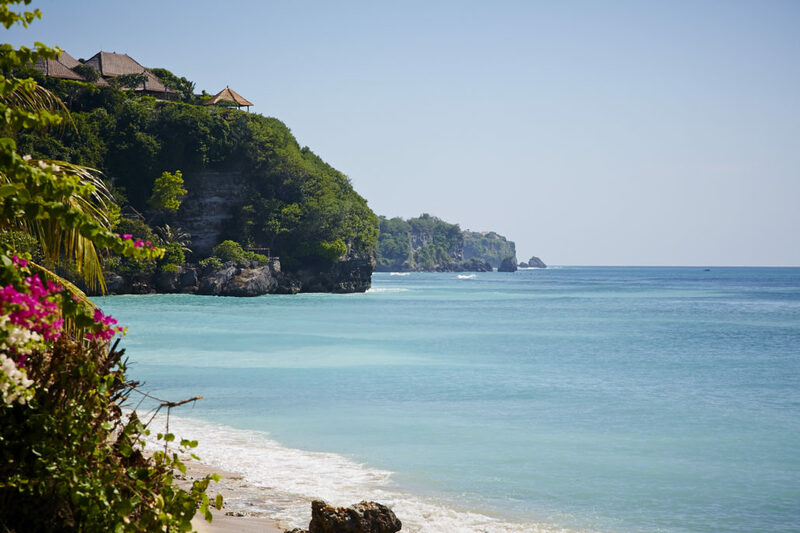 Famous beach clubs like Karma or Sundays are also located on the south bali cliff. The beach clubs are also worth it for a one day trip. But don’t forget your credit card, both beach clubs are very expensive and you can spent easily 50€ a day. Surfing at the Bali cliff is only for experts. Strong currents, big waves and no lifeguards makes it difficult to get a good wave and stay safe. The access to the beaches are not that easy to find and you should use google maps.